In the kitchen at Owl Farm, Dr. Hunter S. Thompson’s compound in Woody Creek, Colorado, the writer sits surrounded by notes and clippings, sipping his tall Chivas Regal packed tight with ice, his headlamp illuminating his electric typewriter. When Thompson looks down at his motto of writerly inspiration, also the title of Wayne Ewing’s latest documentary Animals, Whores & Dialogue, there’s an evident reaction. Thompson seems enlivened by these metaphors as they apply to his process, which is the subject of Ewing’s film. Given the film’s palpable admiration for its subject, Ewing and Thompson were obviously close. Indeed, Ewing has followed Thompson since the 1980s and seemingly dedicated his career to documenting and now releasing footage of the journalist’s last years. He also served as Thompson’s road manager and editor at times. 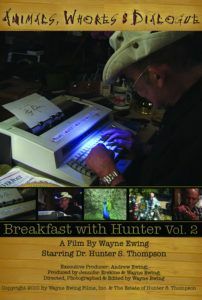 Ewing’s first documentary, Breakfast with Hunter from 2003, served as an appreciation set around the twenty-fifth anniversary of Fear and Loathing in Las Vegas. Next came When I Die in 2005, about the making of the Gonzo Monument that was central to Thompson’s private funeral, funded by friend Johnny Depp. In Free Lisl, Ewing explores Thompson’s successful campaign to liberate the wrongly convicted Lisl Auman, who was sentenced to life after she was wrongly accused of murdering a Denver police officer. Animals, Whores & Dialogue, which does not yet have a page on imdb.com nor Rottentomatoes.com, nor can it be ordered on Amazon.com, makes a low-key debut on home video. The DVD offers the film itself, without any glitz or glamour by way of special features. Ewing gave insightful commentary on Breakfast with Hunter, which even included about 35-minutes of commentary from Thompson, who ditched the recording. (Asking Thompson to make remarks about himself for 90-minutes doesn’t seem like a good way to focus his attention, but it was worth a shot.) Alas, even commentary is missed on this disc; Ewing’s observations throughout helped shape the structure of his first Thompson film, and may have helped here as well. But followers of Thompson’s work or pure documentary filmmaking shouldn’t hesitate to pick up the lot at Hunter Thomson Films (www.hunterthompsonfilms.com), the sole retailer for Ewing’s output. 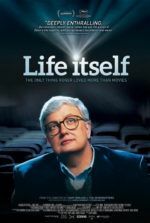 Structure ultimately becomes the film’s greatest downfall and greatest advantage. 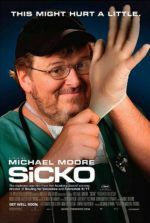 It’s a downfall in that audiences hoping for a documentary that drives toward a clear-cut thesis will find the film impenetrable. Though, Ewing has hardly made this loving film for the general public. On the flipside, Ewing presents material that temporarily restores life to Thompson and his writings through archival footage. 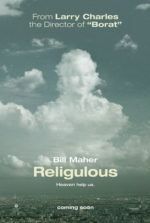 The film’s aloud readings of Thompson’s observations have rarely resounded truer than in the worsening state of today’s American political culture, forcing us to wonder how Thompson would react to Obama’s presidency and the subsequent bureaucracy he’s had to face as a result of his appointment. No doubt Thompson would find joy in writing about the Glen Becks and Sarah Palins, as such characters have always brought out the best in Thompson’s vivid descriptions. Those thoughts are left for us to ponder in the final moments of Animals, Whores & Dialogue, as Thompson’s family and close friends celebrate his posthumous sixty-eighth birthday mere months after his suicide in 2005. It becomes painfully apparent that few commentators could say the things that needed to be said like Thompson could. And even if there are writers with Thompson’s brand of audacity working in today’s media, chances are they’re writing in some dark corner of the internet where they’ll never be half as respected. Sadly, Thompson represents a bygone era where being a journalist (even a gonzo journalist) meant a certain esteem. He made a business and art out of his counter-culture thinking, so losing him stings in a way the mainstream will never understand. Ewing doesn’t pander to his audience in the way moviegoers expect documentaries to nowadays. And perhaps this is why Ewing has publically stated that he’ll be giving up his documentarian career for a return to drama (he was formerly a cinematographer on television shows like Homicide: Life on the Street). When so many propagandizing documentaries “tell a story” more than they offer truly candid footage, the vérité approach of Animals, Whores & Dialogue feels in synch with its subject in a way that only Ewing could offer.